Oakland, CA:, 2017-Aug-01 — /Travel PR News/ — As passenger traffic continues to climb, Oakland International Airport (OAK) today (July 28th, 2017) opens the first phase of its expanded International Arrivals Building (IAB) in Terminal 1. The $45 million construction project, which began in August 2016, includes 13,000 sq. ft. of additional space incorporating a new baggage carousel and an expanded passenger primary processing room. With international passenger traffic up 106% over last summer, the expansion of OAK’s IAB allows the Airport to better accommodate growing demand and increasing passenger levels arriving from foreign markets in Mexico, England, Spain, Denmark, Sweden, Norway, and the Azores. In 2018, Paris and Rome will join OAK’s international roster of nonstop markets operated by Norwegian Air. A more modern, expansive, clean design. A building addition to accommodate an expanded queuing and processing area to improve the primary screening operations, including expanded use of Automatic Passport Control (APC) kiosks. New and updated restroom facilities, seismic upgrades and building systems infrastructure upgrades. New lighting, flooring, finishes, expansive windows and skylights introducing natural light into the new and existing space. Reconfigured offices for Customs and Border Protection services. OAK’s Terminal 1 facility was constructed in 1962, and houses the International Arrivals Building (IAB), which was built as an extension of Terminal 1 in 1972. Prior to today’s opening, international arrival operations had been limited to approximately 300 passengers per hour, the equivalent of one widebody aircraft. However, with the expanded facility, approximately 600 passengers per hour can be accommodated, meaning two widebody aircraft can be processed simultaneously. Additionally, the new space accommodates 16 automated passport control kiosks, doubling availability from 8 previously. 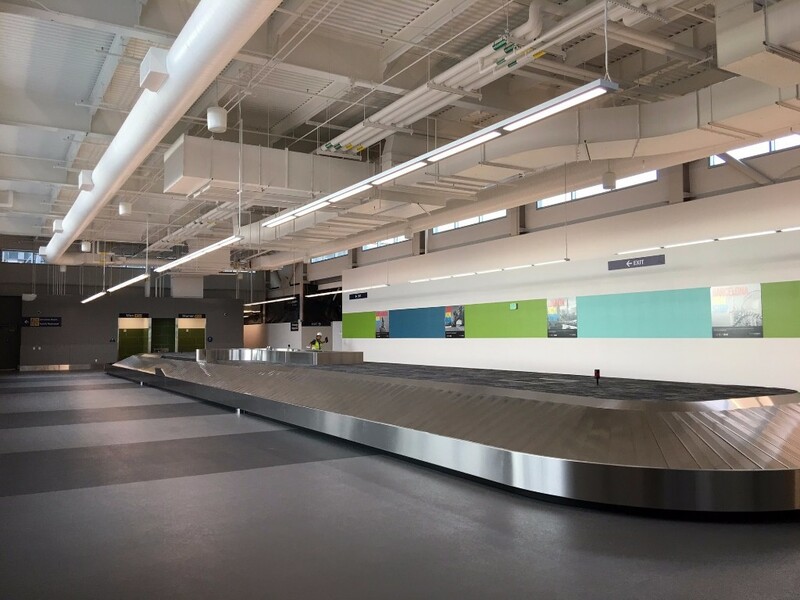 Operations will continue while Phase II construction activities are completed, which include removal and replacement of the existing baggage carousel, completion of interior finishes, Customs and Border Protection (CBP) support space and restroom renovation. U.S. Customs and Border Protection operates within the IAB, meaning the area effectively serves as a U.S. border. Collaboration with CBP throughout the design and construction of the project helped to minimize impact for on-going operations and ensure that the facility meets all required standards. The project is scheduled for completion this fall. Oakland’s air service roster to over 50 nonstop destinations is offered on 13 different airline brands – seven of which operate with OAK as their sole gateway into the San Francisco Bay region. This entry was posted in Airports, Business, Travel, Travel Management, Travelers and tagged International Arrivals Building, Oakland International Airport, Terminal 1. Bookmark the permalink.